Groundscape Solutions, A Fort Worth Landscaping and Concrete Contractor designs and installs a curved concrete patio and then stains it a cola color. This concrete patio is a raised patio off the back of the house. 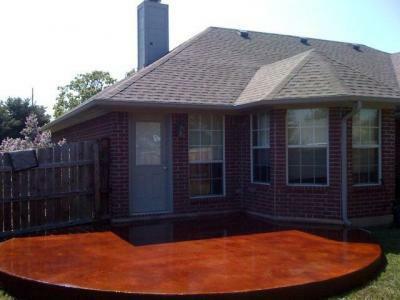 Concrete patios can be stained, stamped, and scored in a variety of colors, designs, and patterns. For more information and a quote give us a call at 817-759-0102 and visit our website at www.groundscape.com Groundscape Solutions is a fully insured landscape and concrete contractor and will provide references.